Note: Some Android phones, when they sleep (hibernate), turn off the phone's sensors. 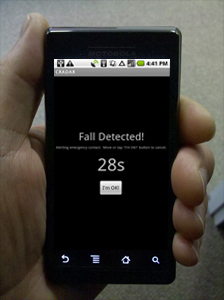 CRADAR uses the phone's accelerometer to sense a fall. If the accelerometer is off, CRADAR will not work. To remedy this we have programmed a warning message to pop up on phone's that have this issue. On those phones, CRADAR will dim the screen but will prevent the phone from going into full sleep mode, in order to keep the accelerometer active. I have been reading in the bike forums from several people who say the sensitivity settings don't work for their phone. Please trythe custom setting. This will properly set the accelerometer's sensitivity for most phones. There have also been questions about the GPS killing the battery. 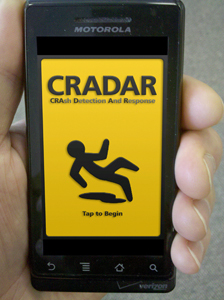 CRADAR does not use the GPS until it detects a fall, so it shouldn't kill your battery. If CRADAR creates a battery issue with your phone, please let us know what phone you are using. If we can't find a work around, we will post the issue so other owners of the same phone know about it. The story below is mine. This app is important to me and I intend to keep CRADAR free and accessible for everyone. "I wish this had been available 10 years ago." Halloween 1999. I was taking the last ride of the season on my perfectly restored, 1975 Suzuki 550. It was a beautiful fall day in Upstate New York with temps in the mid-60's. I was about 40 minutes into the ride, exploring some new territory in the country east of my house. I was just starting into a long sweeping turn when the road went from hard packed gravel to freshly laid loose gravel. The long sweeping turn became my launch pad. It was only a 4 foot drop from the edge of the bank to the field but the bike pitched forward as we left the edge. I landed in a nose down attitude, broke the fairing as I crashed through it, and the bike and I did a couple of endos before coming to a stop. It took a minute for me to focus, and I was having trouble breathing. I was lying in a field, over the bank of a back road that didn't get much traffic, and nobody knew where I was. As it turned out, I had a broken back, a couple of broken ribs, a separated shoulder, and some seriously bent up thumbs. Not a good day. I wish something like CRADAR had existed back then. 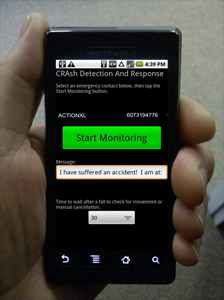 CRADAR is a man-down application that runs on any Android phone. CRADAR senses when you fall, waits 30-120 seconds (whatever you set it for), and if it doesn't see you move at least 8 feet, sends a text message to one of your contacts telling them you might be hurt. This gives your contact a chance to call you to see if you're ok. In the text message is a link to Google Maps with your GPS coordinates. If they don't get an answer, they know exactly where you are, and have the GPS coordinates so other people can find you too. CRADAR starts in the configuration screen. Tap the contact line to change your emergency contact. Tap the message line to change the message. Note: There is a maximum limit of 48 characters due to the maximum text message size. The rest of the text message will be taken up with a link to Google Maps and your GPS coordinates. Tap the timer to change the number of seconds to wait before an emergency notification is sent. Once you have configured CRADAR, tap the Start Monitoring bar. You can leave the CRADAR screen by pressing the back button. CRADAR will continue running in the background. If you want CRADAR to stop monitoring, return to the CRADAR screen from the notification bar, and tap the Stop Monitoring bar. Once a fall has been detected, your phone will start ringing and vibrating, and the counter will start. If you move more than 8 feet, or tap the "I'm OK" button before the timer runs out, the alert will be cancelled and CRADAR will continue monitoring. "My phone detected a fall. I may be injured. http://maps.google.com/maps?q=42.484506368637085,-76.48738503456116&ll=42.484506368637085,-76.48738503456116&z=16"
Your contact can tap the link and see your exact location in Google Maps. CRADAR is a free Android application from ActionXL. 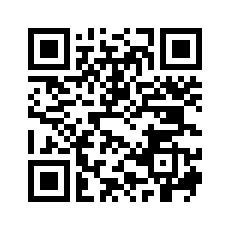 Use your Android phone to search the Marketplace for CRADAR, or scan this code with any barcode scanning application.